Chelsea could reportedly agree a €45m deal with Sevilla which would see Alvaro Morata initially leave Stamford Bridge on loan in January. As noted by BBC Sport, the Blues splashed out £60m to sign Morata in 2017, but unfortunately for all concerned, it hasn’t worked out as hoped. The 26-year-old managed to score just 15 goals in 48 games last season, while he hasn’t shown many signs of improvement this time round with nine goals in 24 appearances. 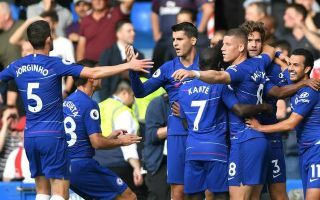 In turn, question marks have to be raised over whether or not he is going to emerge as the prolific forward that Chelsea ultimately need in order to compete on multiple fronts moving forward. If it’s decided that he isn’t the right man for the job, then the latest reports would suggest that the Premier League giants could have a perfect opportunity to sell, albeit while accepting a loss. According to Calciomercato, it’s suggested that Sevilla could be ready to pay €5.5m this month to take Morata on loan for the rest of the season with a €40m option to buy at the end of the campaign. By moving Morata on, Maurizio Sarri could then see a replacement arrive to offer a prolific threat up front to help Chelsea achieve their objectives this season, with Marca suggesting that Gonzalo Higuain could be on the brink of a move to Stamford Bridge. Time will tell if the pieces fall into place for Chelsea, but as seen on Tuesday night in their defeat to Tottenham, they are certainly missing a top-class forward to lead the line and offer them a player capable of getting them out of trouble with a clinical eye for goal. Sadly for Morata, he hasn’t done enough to this point to suggest that he can be the solution for them and so perhaps a move elsewhere to regain his confidence and best form is needed from his perspective too.